Home › Ciaran Carson › The secret is out… Announcing our latest book, The Shack. 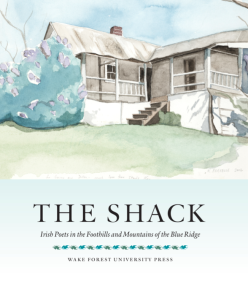 We’ve been waiting so long to tell you about our newest book, The Shack: Irish Poets in the Foothills and Mountains of the Blue Ridge, that it’s hard to believe we can finally talk about it. In The Shack, contemporary Irish poets reflect on their time in the foothills and mountains that straddle North Carolina and Virginia. The volume is a conversation in poetry and prose across a wide array of circumstances and decades that was generated by WFU Press founder and long-time director Dillon Johnston’s bold venture in launching an Irish poetry press at Wake Forest University in Winston-Salem, North Carolina. It’s an unusual volume for us, a labor of love that grew from both personal and regional origins. The book is dedicated to Johnston and his wife and co-publisher Guinn Batten. Today, we’re gathering with friends and family of the Press to surprise Dillon and Guinn with the book, hence why we’ve kept the book a secret until now. We’ll post pictures from the book launch soon, but in the meantime, you can enjoy the title poem by Michael Longley. As Longley writes in the commentary he wrote to accompany the poem, “Wherever we are—in North Carolina or Missouri, in Belfast or County Mayo—we talk about the inner adventure of poetry.” We are so happy to finally share this particular adventure with you today. I lie awake between the two sleeping couples. The downpour’s crescendo on corrugated iron. While I remain motionless on my creaking divan. And buzzards like mobiles where the storm clouds hang. The equalising lime has covered our excrement.